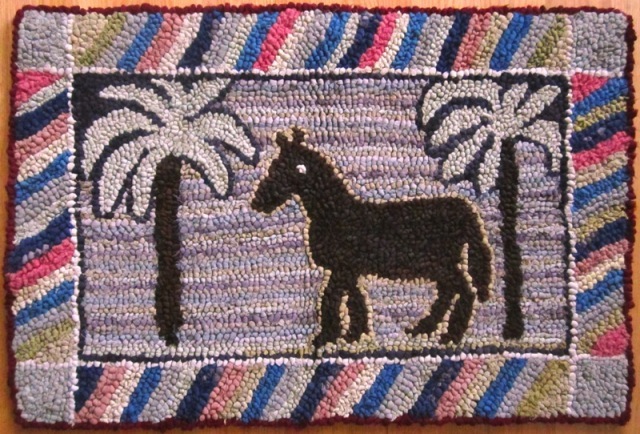 Collectivator :: "ANNA'S MAT" - MID-19TH CENTURY WATERLOO COUNTY HOOKED RUG IN MINT CONDITION - ILLUSTRATED IN "ANNA'S ART"
Hooked rug by Waterloo County Fraktur artist Anna Weber. Purchased in 1975 from a family member of the person for whom it originally was made. Had been preserved as a keepsake and never used. Measures approximately 31 1/2" X 21".